I wanted to find an animal hospital as soon as possible. I thought the animal had possibly been run over, but I wasn’t certain. It did also look very skinny. After setting the animal on the side of the road, I asked a nearby security guard where an animal hospital is, and he pointed me in one direction. He basically told me to turn right on the closest road by the McDonald’s, but later I found out it was the wrong direction (I turned left on the nearest road). Then, along the way, I asked various other people where the nearest animal hospital was. Many people either didn’t know, or weren’t sure where it was. Many pointed us in the right direction, but didn’t tell us the proper distance. 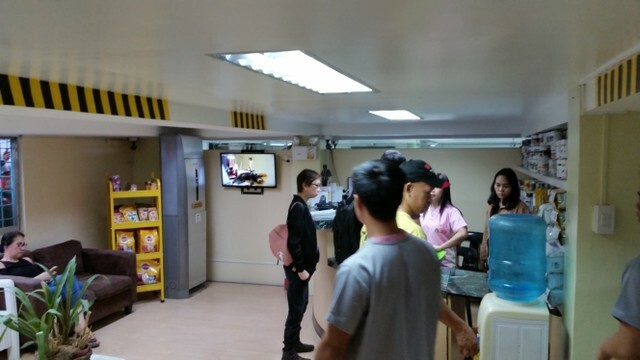 I asked various security guards (you will see security guards everywhere in Manila), and then after crossing a road, I saw what I think was a Watson’s pharmacy, and I asked people in there where an animal hospital was. I still kept asking people along the way, to make sure I was going in the right direction. In any case, I wanted to first find the animal hospital because I was in a foreign country, and wanted to make sure I knew exactly where the hospital was before I went there. I tried going quickly though. The deaf/mute man and I walked and jogged along the way. 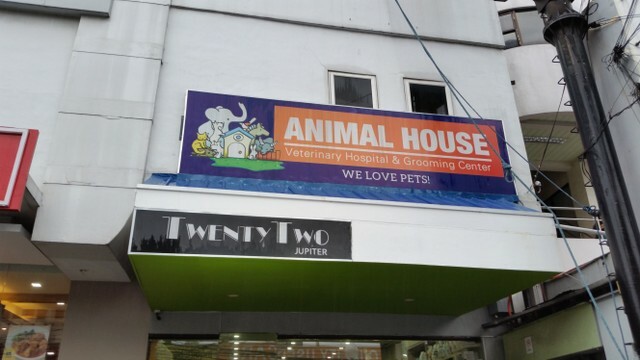 The animal hospital was much further than I initially thought though. It turns out that there are two parts of the hospital, both of which are separated by different buildings and businesses. The first part of the animal hospital was for non-emergencies. The employees there told me to go to the other part of the hospital, the one for emergencies. Then I told someone at the emergency section that I found a cat that I think may die soon, and I wanted to know if I could bring it here. They indicated that I could bring the cat there, and I told them I would come back later. The outside of part of the animal hospial in Makati, Manila, The Philippines where I took the cat. I thought the cat wasn’t in critical condition because it was alive when I left it, and thought it could handle waiting a little longer. It may have been the cat died right after we got it out of the road, but I will never know in any case. After finding the hospital, which probably took more than 20 minutes, we then went back to where we left the cat (which I think was next to a bank on the side of the road). Sadly, I think the cat died while we were looking for the hospital. But, I still thought the cat might have a chance and the deaf/mute man helped me come up with a contraction to carry the cat. Originally, I carried the cat with a broom stick and a dustpan because it was what the deaf man thought would be good (and all I had easily available). I also liked it because it allowed me to carry the cat without me actually touching the cat with my body (I was still a little afraid the the cat might have diseases). Later, the deaf/mute man got some cardboard for me, and then I was able to just carry the cat with a dustbin with cardboard at the bottom. The deaf/mute man followed me to the animal hospital again, and I tried going as quickly as I could jogging along the way. I ran pretty hard part of the way. 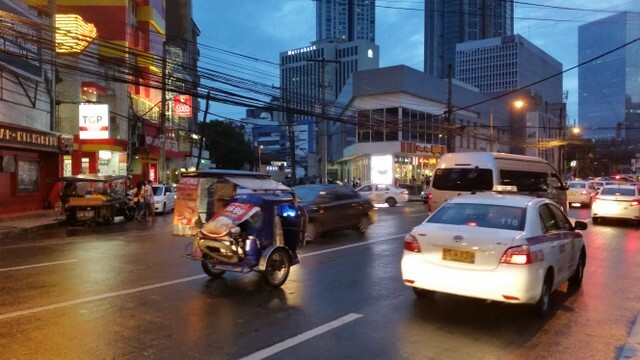 I didn’t think of getting a motorcycle or taxi because I didn’t want to potentially deal with shenanigans with transport (they sometimes happen especially in 3rd world countries). I just wanted to get the animal to the hospital as fast as I could. Since I was a decent runner, I felt I could run with the cat by myself. Eventually, along the way, it started pouring rain, but I still ran through the rain because I thought the cat might still have a chance to live. I got soaked, but still really wanted to help the cat. Finally, I got to the the emergency section of the animal hospital, and employees saw that I was carrying a cat, and they let me right in. 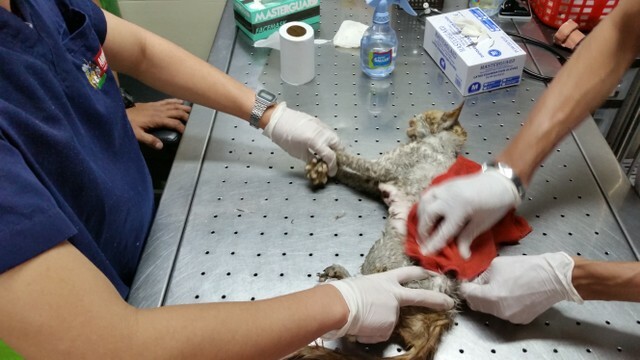 Two men, who were either vets or some kind of vet assistants put the cat on an operating table, and assessed the situation. After a little time, they determined that unfortunately the cat was dead on arrival. The cat on the operating table. Rest in peace cat. While watching them assess the cat, and listening to them explain some things to me, I noticed that the cat had a major gash on part of its underbelly, and much of that part looked like a tumor. So, it looked like a ripped open tumor with literally a hole in the cat which you maybe could see some of its innards. 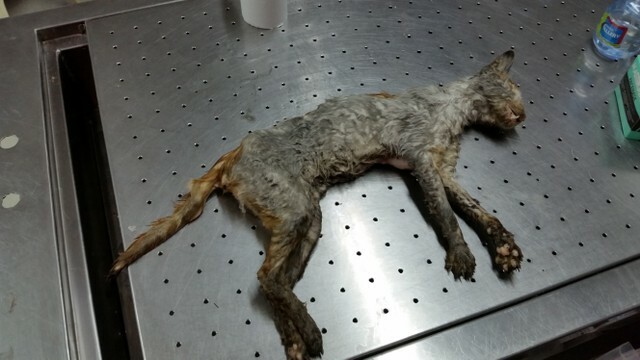 I don’t know if the cat had had cancer and its tumor basically exploded, whether it was run over by a car, or a combination of both, I’m not sure. A vet/vet assistant said they wouldn’t know for sure about where the cat had had cancer unless they did some kind of test to make sure. But, since the cat was already dead, I guess they figured they wouldn’t do the test. The vets cleaning and preparing the cat for eventual burial. The main reason I stopped to help the cat was that I saw an animal in a major road in the Philippines. The animal was not running, not walking, but crawling across the street, which made me really sad. So, I wanted to help. A photo of the area in the street where I found the cat. Photo taken the day after. A photo of the area in the street where I found the cat. 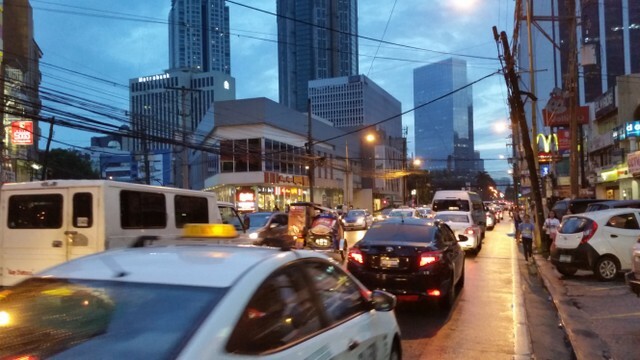 Notice the traffic. Photo taken the day after. The cat may have been doomed right after I saw it in the street, but I still thought it might have a chance. I didn’t hear the cat cry or anything, but it did show it’s teeth in what looked like it was in pain. I knew I could have left the cat there on the side of the road, or just not helped at all, but I really wanted to help it. The deaf/mute man was very helpful, but it was difficult to communicate with him. I did use Google translate to translate to Filipino for him with text which helped a little. I wrote this post not to brag or boast, but just to share a story about a day in my life. I think compassion and empathy are universal, thus they go beyond languages and borders etc. I really believe that more compassion and empathy can help make the world a better place. I know I could have just gone on my way and just ignored the cat, but something, I’m not sure what exactly, compelled me to help. 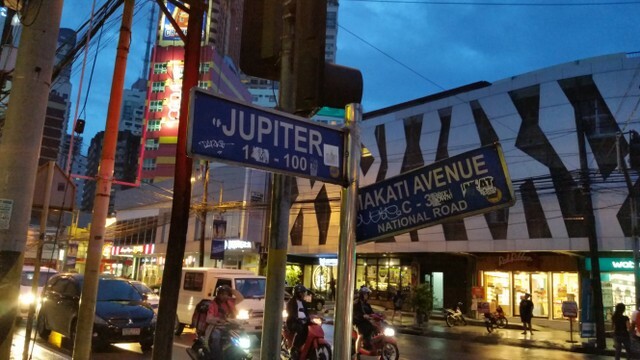 In Manila, I have noticed that there are a lot of stray cats, but I haven’t notice many stray dogs. I previously fed a stray cat a few times close to a bridge by my apartment. This was a special experience for me. I thought I could save the cat’s life. Maybe I shouldn’t have tried to find the animal hospital first without the cat and instead ran holding cat from the beginning when I was sure it was alive. But, I don’t know how that would have gone because running and holding a moving cat and also trying to ask around where the animal hospital is might have also been in vain. Sadly, I was afraid of getting bitten and/or scratched, and was worried the cat might be diseased, which is partly why I wanted to know for certain where the animal hospital was before I went there. Initially I didn’t think of a way to carry the cat. I wish I had known where the animal hospital was before, so I could have run from he start towards the animal hospital or gotten a taxi or a man in a motorcycle to drive me. The distance was a little far, but I could run the distance decently. The animal hospital staff were nice to me. I told them the cat wasn’t mine, and that I just wanted to help it. They said since the cat was dead on arrival, so they wouldn’t charge me anything for looking at the cat and trying to determine if they could save it. But, since the cat was now a corpse, initially they wanted to charge me more than 1000 PHP (Philippine pesos) to bury the cat. 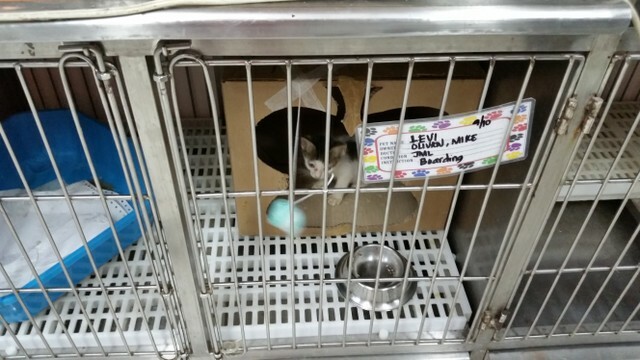 Later, the owner of the hospital decided to pay the burial fee of the cat for me, in effect making it free for me. I was very grateful that she did that. Later, I found out from one of the vets that that was a private hospital, though I’m not sure how that actually affects how the animals are treated. Because it was an emergency, when I got to the right section of the hospital, I literally didn’t have to wait even 1 minute. I was immediately let into the emergency part of the hospital which included an operating table. The entrance to emergency room of the vet clinic. 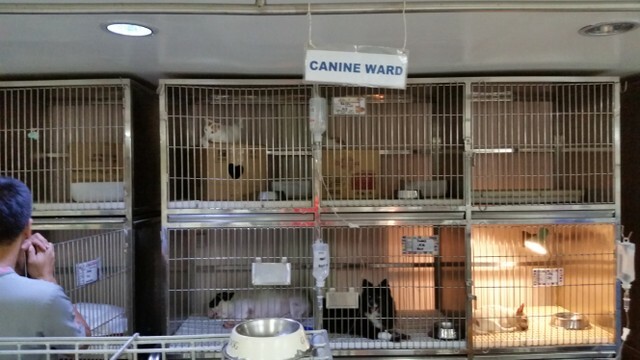 The waiting area of the emergency room for the vet clinic. I didn’t have to wait at all here. They just let me immediately into the emergency room when they saw me with the cat. I was carrying the cat in a scooper / dustbin, and they let me right in. Yes, maybe I should have tried to carry it in some other thing, but I had no time, and that was all that was available for me to carry the cat in. 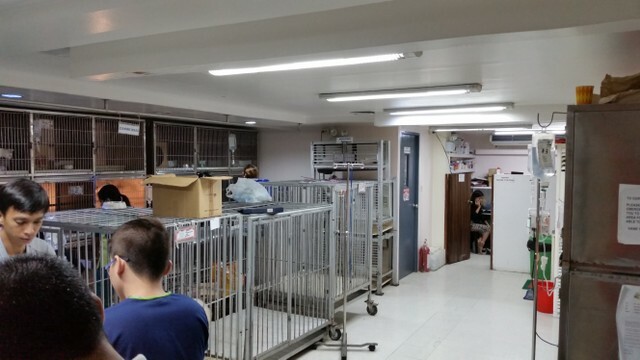 This is a view of the emergency room part of the animal hospital. 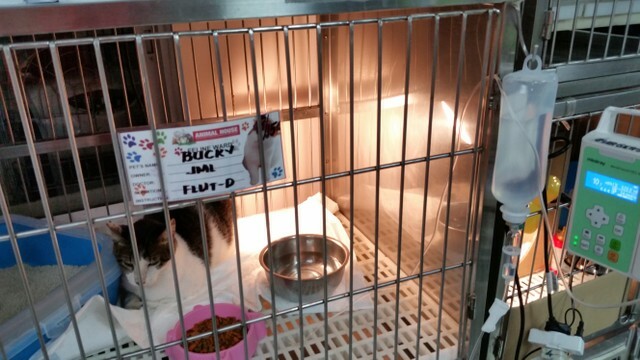 The emergency room had other animals in there too, but all of them were in cages. This is a cat in the same area where I took the injured cat to the hospital. This cat, if I remember correctly, appeared to be almost blind. 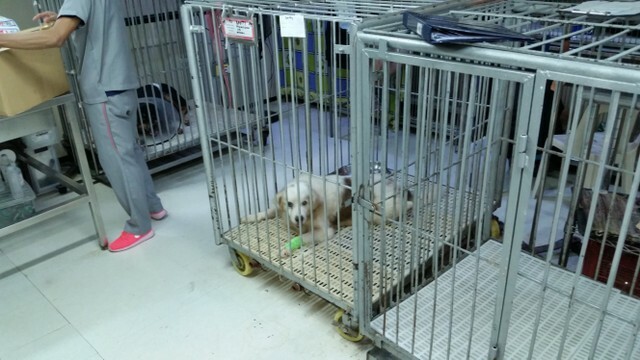 There were some dogs and cats, and some of them looked very sick, blind, or having some other ailments. 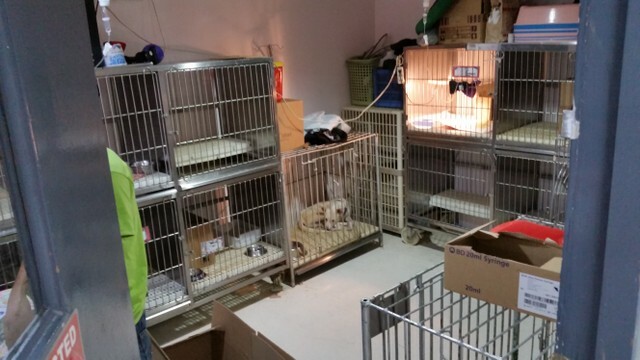 Some cats and dogs in cages in the clinic. Some more animals in the clinic of the emergency room. 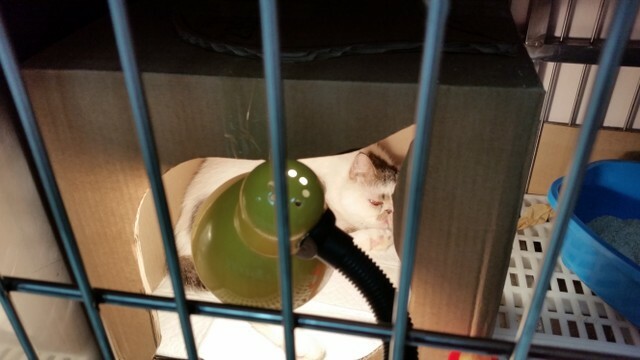 I also saw a mother cat and some very young kittens in a cage. It was sad to look at some of the animals there including a dog which appeared to be whimpering or maybe was just scared. A mother cat with kittens. Unfortunately the lamp in the picture appears to be blocking the kittens from view. 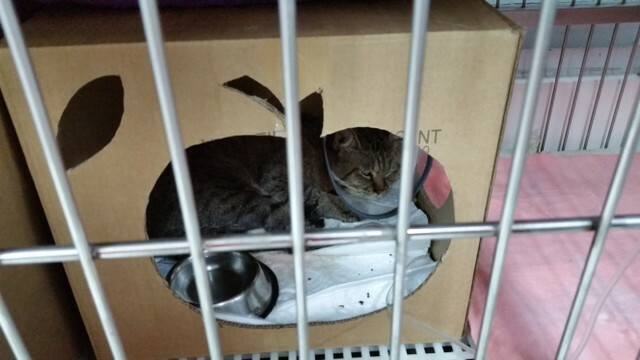 A sick cat in the clinic. Notice the IV going into its leg. 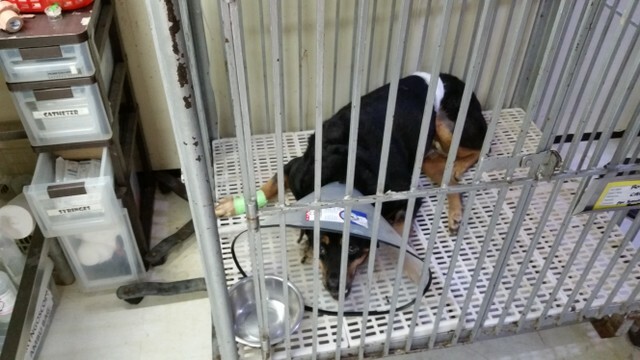 An injured dog in the clinic. The dog that was whimpering. From the looks of it, it might be injured. In any case, I felt bad for it. A cute kitten I also saw in the same part of the animal clinic. I certainly hope I remember this experience for the rest of my life. I tried helping an animal in need, and made a friend along the way (the deaf/mute man). Although the man and I can’t speak each other’s language, and given the fact that the man is deaf/mute, somehow, amazingly, we were able to communicate that we wanted to help this animal and to work together to do so. 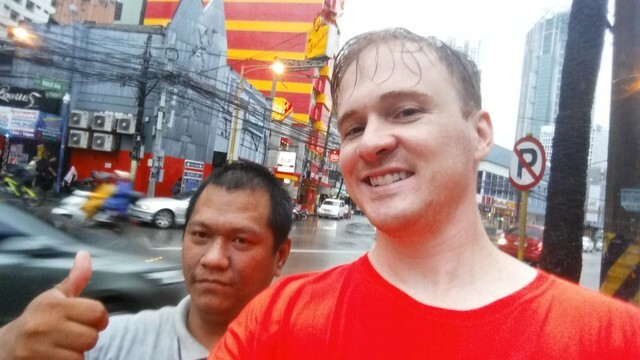 The mute/deaf Filipino man and I after we left the hospital and went back to where he was originally staying before he helped me with the cat. 1. The saying, “where there’s a will there’s a way” was re-affirmed to me. 2. In an emergency situation, you have to do what you have to do. There’s no time to deliberate. You just have to do whatever you can as quickly as you can. 3. I really believe that many things about humans are universal. I found sympathy, compassion, and empathy to be among those things during this experience. 4. Doing the right thing can be hard and even dangerous. 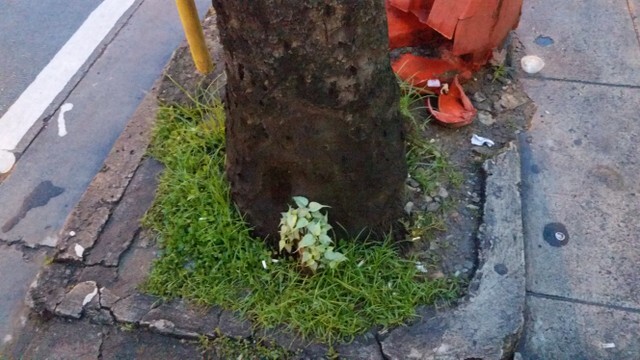 I was in part of Makati, Manila, which is one of the most urban parts of the Philippines, and saw an animal crawling in the middle of a major road. I definitely put myself at risk by running into the road and wanting to help the animal, but I thought it was worth the risk. I do think that attempting to help the animal was the right thing to do, and if nothing else, I feel better about it having tried to help it than I would have if I just left it to die. What did you think of this post? Do you have anything to add? Let’s continue the discussion in the comments below.